Caister Beach car park, Great Yarmouth, has approximately 220 spaces and 12 spaces for the disabled, however they are not marked. 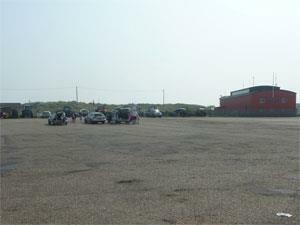 The car park is immediately adjacent to the beach and to Caister Lifeboat Station and Visitor Centre. 2 metre height limit. From the A1064 from Filby proceed into Caister-on-Sea and go straight over at the traffic ligths with Aldi on the right. At the mini roundabout turn left. From the A149 from Great Yarmouth, turn right into Caister-on-Sea at the roundabout. Drive into Caister going past Tesco on the left .Continue through the village, straight over the first mini roundabout. At the second roundabout turn right into Beach Road. Proceed down Beach Road to nearly the end, Caister Beach car park is at the bottom on the right.